Gulp! 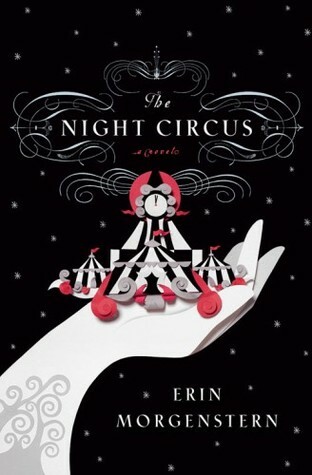 I hear the shocked gasps as I write this because The Night Circus did not rock my world as it has so many of my book friends. First up, the synopsis: Celia and Marco are bound to a magic duel that lasts as long as it lasts and in which they create lovely tricks and do-dads for Le Cirque des Reves. Celia was born with particular talents while Marco has his book learning. Celia's really awful father pledged her without her consent when she was a child to a challenge with his adversary's student. Her Dad's nemesis (or whatever he is) plucked Marco off the street in a My Fair Lady sort of way. As adults, Celia and Marco manipulate the circus in progressively greater acts of magic to the delight of audiences while at the same time totally messing with the performers. With each passing year the circus continues to travel the world as Celia and Marco wonder when it will all end. I've been trying very hard to put my finger on why I only liked The Night Circus by Erin Morgenstern while everyone else thinks it's the best thing since Kraft cheese slices. That's a tough one. At first I thought it was the audio, which I had some issues with (tell you later), but that's not it. Maybe it was the magic? No. I listened to The Book of Lost Things a couple of years ago. It was on audio and it involved magic. Yet that book nearly brought me to tears. The Book of Lost Things has a motherless child who enters a magical world. There is a lot of emotion in that book: grief, acceptance, forgiveness. I was connected to the protagonist. That is where I feel The Night Circus failed me. I was never connected to any of the characters. I didn't love them, I didn't hate them. I didn't get a true sense of who they were or what really motivated them. The true protagonist of this story is the circus. It's like the Cirque du Soleil on crack. The imagery of the circus, the black and white tents and the mysterious contents of those tents, is beautifully written. Who wouldn't want to go to Le Cirque des Reves? There is nothing spooky or scary about it. It's a circus built for happiness. If not for the circus and the beautiful descriptions, I wouldn't have kept listening. I'm probably being a little harsher than usual on a debut novel but The Night Circus has a lot of fans. It can take it. I think Morgenstern is doing all right. Even if it didn't blow me away, it did for 80 billion other people. And if it didn't do it for you, come join me at the sad people's table. About the Audio: (I realized it needed new headphones but that has nothing to do with anything.) Jim Dale narrates The Night Circus and I guess he did Harry Potter too. He wasn't too bad but I had a hard time really listening to his narration. I'm not sure why. Also, he gives the twins a thick Irish accent which made them sound 100 years old (and a little bit like Mr Dress-Up). I cringed whenever they spoke. Recommended if you like circuses and magic. I might have felt like you did about the characters had it not been for Bailey. He's the one that I connected to, and he's the one that drew me in. I'd say he's the true protagonist. There was a bit of distance with the others, but I think that was by design, especially with Celia and Marco. They aren't meant to make any connections with the rest of the world. They're just meant to compete. I think that's why their ending was so poignant for me. I think, probably, that the narration took away from Bailey's story line a bit. Since he's always with the twins, those accents would have been distracting - at least for me. I hope, someday in the distance, that you'll give the print version a chance. It might have a different effect. P.S. I think that the comparison with The Book of Lost Things really helped me see your point. I'm glad you included it. It stands to reason that this book isn't going to work for everyone. And, I am sad you had problems with the audio because I was hoping to reread it through audio at some point. Ha! I had the same thought about Cirque du Soleil, though I like the way you put it. My biggest complaint was that it was slow, but it ended up not bothering me too much, because I really enjoyed the experience with the circus. Cassandra- I had moments where I thought Bailey was going to save it for me but then it wouldn't happen. It was up and down for me but in the end it was mostly down. I always wonder when I don't like an audiobook if I'd like it in print, even though I've enjoyed other audios in the past. It's hard to say. Kailana- It might be just me. The accent thing might just be one of my dislikes. Melissa- I did find it slow in the middle. Glad you ended up liking it! Andi- The atmosphere was a big part of why I kept reading. I am just a little ways into this one and it's slowwwwww. I am wondering what all the fuss is about, but I am really not far enough in to decide if I like it or not. Your review doesn't surprise me. When a book is as hyped as this one is, I appreciate honest, well written reviews. It's rare that a book lives up to its hype. I am not that big on magic so maybe it's the subject matter that is not working for me. I actually thought the characters were very strong, but I see that people are very conflicted on this particular point. Maybe it just has to do with the style of characterization and who does and does not connect with Morgenstern's way of doing it. I thought everyone from the main characters to the extras in the background were far more alive than in most books. I didn't expect to be blown away. I expected not to like the book at all. But it definitely joined my top books of the year. Haven't read this one yet but have seen lots of buzz about it- it's good to have other opinions to consider. I actually like reading a review that's not glowing. There's no way a book can work for everyone and this kind of keeps my expectations in check for if, and when, I read it. I picked this one up a few weeks ago because everyone was raving about it. I couldn't get into it so I moved on to something else with the thought that I'd get back to it... someday. You might have enjoyed it better in print. Sometimes too, a book that is getting raves just can't live up too expectations. I read this before i saw any reviews and just loved it. I'm really glad to read your review to temper things out. I've heard such glowing things about this book I've been kind of put off by all the hype. I'm with you at the sad people's table! I thought it was just okay and struggled to finish it because of the slow pacing and lack of plot development. While I loved this book and the atmosphere it created for me as I read it, I'm glad to read a less than stellar review. I think it's healthy to see a book from viewpoints that differ. I understand why you didn't love it, yet I'm glad to hear you did like it. I've read it and plan to listen to the audio as a re-read. I liked Jim Dale's reading of the Harry Potter series (with a few minor quibbles), but I'm concerned that having listened to him read that entire series, that I might hear Harry Potter characters in his reading of this book. As I told you on GoodReads, I completely agree with you. The characters seemed totally one-dimensional to me, and the plot had so many random inconsistencies that were never really explained. I adored The Night Circus, and I absolutely agree with your complete apathy for the people characters. I didn't really care about the competition, or the falling in love junk, or the twins bein' all psychic and whatnot (though I did want to steal their kittens). And I especially did not like the last bit with the OMG stories. But I am still counting this among my favorite books this year, if not ever, because even when something was completely boring or made me roll my eyes straight out of my head, I still wanted to be swept up in the beauty of the circus. It's really like Celia's carousel to me... even if I don't get to ride the gryphon and I'm stuck with some rabbit, I totally want a second go! Ti- I'm thinking a liking for magic is a requirement. Amanda- The characters seem to be the hinge that swings this book for the reader. If people like them, they love it. Bookfool- The circus is a big deal in this one. But it is a nice circus. Alison- I'm glad that it still worked for you. I found audio books really tough to review because regardless of their quality, I think my opinions are always different than they would be if I read it. I just read The Name of the Wind and while it was good and the narrator was awesome....I know I have a different opinion that I would have had I read it. I'm quite curious about The Night Circus too. I didn't know it was going to be such a big book. I also have such huge expectations I hope I'm not disappointed too. :-( Especially for the twins...I didn't imagine them with Irish accents at all.